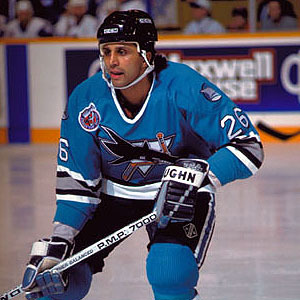 The list of players of East Indian descent to have played an NHL game is far and few. Robin Bawa. Manny Malhotra. That’s it. Ajay Baines, while a veteran AHL defenceman has never played an NHL game. In recent years however, we have seen a rise in the number of players of East Indian descent being drafted to the NHL. 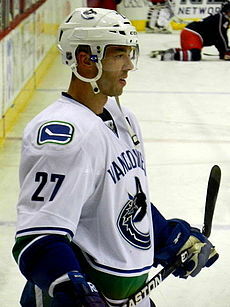 Prab Rai was selected by his hometown Vancouver Canucks in 2008. 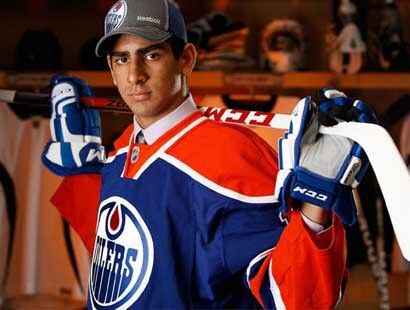 Kevin Sundher was a 3rd round selection by the Buffalo Sabres in 2010 & Jujhar Khaira was a 3rd round selection by the Edmonton Oilers in 2012. In fact this year, the Everett Silvertips of the WHL are fielding a groundbreaking team never before seen in the sport. An all-Punjabi line featuring Vancouver-area players Khaira, over-ager Manraj Hayer, and the 2014 draft-eligible Tyler Sandhu have taken the team by storm. In fact, it’s surprising this story hasn’t been covered in greater depth. Perhaps until a player of East Indian descent makes a significant impact in the NHL these types of stories won’t receive greater coverage. As it is, the NHL is still a league comprised of over 90% Caucasian players. Khaira in particular has risen quite quickly in the Edmonton Oilers’ prospect ranks, and has become a player the team is counting on to become their long-awaited power forward. 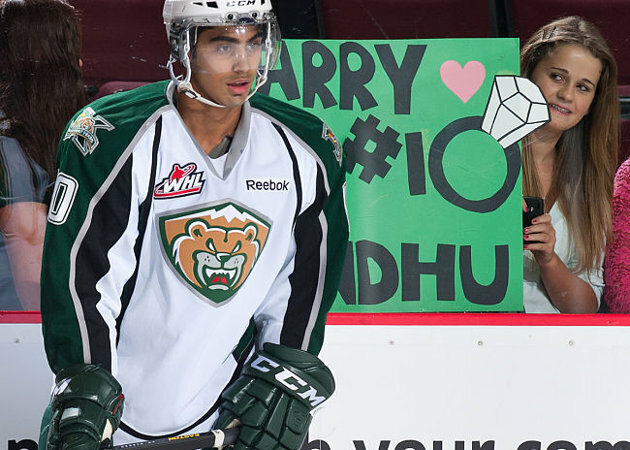 Khaira represents a particular hope for both the Oilers and young Indo-Canadian boys throughout the country. He is what some would call the stereotypical Indo-Canadian. A Surrey, BC native – the son of a gravel truck owner-operator. A first-generation Canadian. Ice Hockey itself is a quickly growing sport among the South Asian community. Ball Hockey still remains extremely popular with this subset of young athletes, but ice hockey participation in Brampton, for example, reported a 20% increase from ethnic or immigrant families. Part of this reason may be attributed to Hockey Night in Canada expanding its broadcasting platform to include Punjabi-language telecasts. Now all of a sudden some immigrant parents who could not previously understand the English telecasts are developing an interest in the sport. And in turn with that, registering their young boys in the sport. Average online viewership of the Punjabi broadcast has grown nearly 50% since the 2011-12 regular season, with playoff games noticing a particularly sharp increase in viewers. 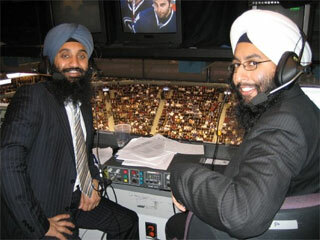 According to Harbs Bains, president of the Surrey Minor Hockey Association in British Columbia, “this broadcast has really helped the Punjabi community to connect with the sport. It allows someone whose first language is not English to connect with the sport and between generations.” The name Harnarayan Singh has become to the Punjabi community what Jim Hughson or Chris Cuthbert are to the mainstream Canadian television viewing audience. This step appears to be crucial in developing a young wave of South Asian hockey players. Hockey growth in Canada has become so structured and groomed that now players are basically on skates from the time they can walk learning to play systematic hockey all the way through their development. What has often hindered young South Asian families has been a combination of the high expenses to play the sport and the lack of exposure to parents in how to advance their children to the next level. The South Asian community has now become heavily interwoven in the Canadian landscape and a number of South Asians run prominent businesses throughout the country. Part of the next phase of development will definitely be reliant upon these businesses to help grow and invest in their youth. The CBC Punjabi-broadcast has helped immigrant parents create a greater understanding and interest in the sport, and Hockey Canada has developed training material to help educate parents on how to advance their children through ice hockey. With South Asian parents and grandparents now understanding and connecting with the sport, the kids are now starting to enter the sport at the ages of 5-6, rather than the stunted point of enrollment at 12-14. Whether players like Khaira or Sundher ever make a pointed impact in the NHL is yet to be seen. However with ice hockey exposure to the South Asian community growing at a rapid pace it’s only a matter of time before we see players from these ranks become more commonplace and influential in the NHL – in turn creating a magnet for young South Asian boys to one day aspire to become.